My laptop called for reinforcements, the tasks at hand were exhausting and overheating it. The cavalry arrived yesterday in the form of a Lenovo IdeaCentre K300. After spending hours at Best Buy, jumping from computer to computer, laptop to desktop, processor to processor, it came down to build quality. 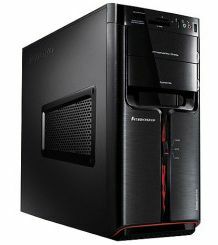 The K300 is built like the machines of old, sturdy casing, spacious, with ample room for upgrades. With side vents for ventilation, the machine runs whisper quiet. Built like a tank is back in the vocabulary. Since Lenovo mainly builds machines for business, it shows in how little bloat was installed with Windows 7. On some of today’s machines, it takes less time to install a clean copy of Windows than it is to remove all the factory installed bloat. Lenovo woke up in it’s new home at 11:11pm last night, by morning I had all my peripherals configured and applications installed and was back to being productive. Windows 7 installed drivers for every peripheral, I never needed to hunt down a driver disc. With the aid of an external USB drive, I copied everything off the laptop and onto the desktop, it was a very painless transition. My time is spent working with text, programming and adding content to websites, this leaves me very little time to play games, so the Pentium E5700 dual core processor is plenty fast. With 4gb of DDR3 ram and a 640gb 7200rpm SATA drive, operation is silky smooth. When ram and terabyte drives come down in price, I’ll be ready for an inexpensive upgrade.